The Bourbon's Modified Leadbeater's sugar glider diet (BML) is a version of the original Leadbeater's Diet, a well-known, nutritionally complete diet for pet sugar gliders. The BML diet is widely accepted and you can make it easily at home. The BML diet for sugar gliders should not be used in conjunction with other formulated diets, such as Brisky's Sugar Glider food or Sunseed Sugar Glider Formula. If any part of the recipe is changed or substituted your glider will probably not eat it (gliders can be picky). After preparing a batch of the BML diet, you will have a real meal time saver on your hands since this recipe will create ready-to-serve cubes of food that you can feed to your sugar glider each day. Blend the honey, egg, and apple juice in a blender until it is smooth. Turn off the blender and add the Gerber juice and Rep-cal Herpivite Vitamin Supplement. Blend the mixture until it is smooth and then turn off the blender again. Add the Rep-cal Calcium Supplement (​buy from Amazon) the chicken baby food, wheat germ, and dry baby cereal. One last time, blend it until it is smooth. Pour the mixture into regular size ice cube trays, filling each compartment only halfway. Then place the half-filled ice cube trays in the freezer. Once the mixture is frozen, simply place one cube of the BML diet in your sugar glider's food dish a few hours earlier than feeding time (which is typically in the evening) to allow the cube to melt a bit. Remove it the following morning to avoid any food spoilage or attracting any unwanted insects. The BML diet should be fed along with fresh or frozen fruits and vegetables at each meal. If you are using frozen food items then you can place them in the food dish at the same time as the frozen cube of BML diet to allow everything to thaw together. By the time your sugar glider is ready to eat, its food will be soft. A full ice cube equals about 2 tablespoons and the BML diet should be served in 1 tablespoon increments, along with 1 tablespoon fresh or frozen fruit and 1 tablespoon fresh or frozen vegetables each evening. This is why you only fill the ice cube tray compartments halfway with the BML diet when you are preparing it. Smaller ice cube trays that can be fully filled are also available if you'd prefer those. Small snacks, such as mealworms, fresh fruit, or treats may be offered mid-day along with this diet if your sugar glider is extra hungry but the recipe for the BML diet itself should not be altered. 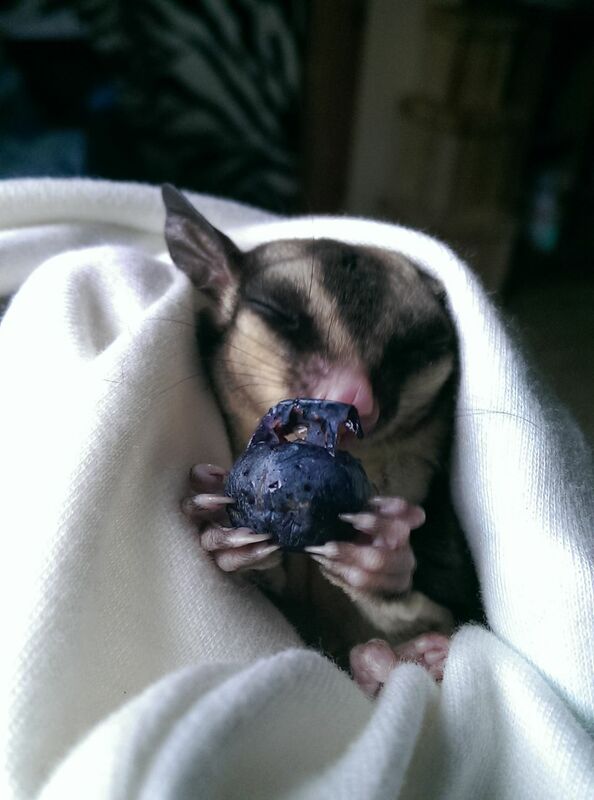 Sugar gliders have very specific dietary requirements that keep them healthy and happy. A diet lacking in calcium and appropriate vitamins, for example, may contribute to your sugar glider developing metabolic bone disease (MBD), like reptiles commonly get, and make their legs more prone to fracturing. Diets lacking in honey or sugary nectar (which they eat regularly in the wild and are named after) do not provide enough energy for sugar gliders who need it for all the jumping and gliding that they do. They may not be as active, mentally stimulated, and strong without it.